Home Bus Jobs Modern Coast POLL:Which Bus Company Is Best In Service Delivery, Time Management and Safety? POLL:Which Bus Company Is Best In Service Delivery, Time Management and Safety? 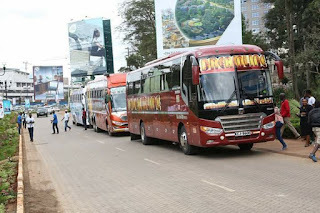 It Has Been Months Since We Last Heard Of Bus Polls Conducted To Our Bus Companies Based On Their Merits In Service Delivery, Time Management, Passengers Safety, Best Plying Routes, Awesome Bus Fleet Among Others. Today We Take This Initiative To Ask For The Public Opinion and Bus Lovers In Which Bus Company Is Overall Best In 3 Categories i.e Service Delivery, Time Management and Passengers Safety? Please NOTE This Poll Will Help Bus Companies In Areas Of Improvement Thus Improving Customer Services To Their Clients. You Can Drop In Your Comments In The Comments Section Below In Areas Of Improvements For Our Bus Companies. Dont Forget To VOTE & SHARE!! Thanks For The Comment. Hope You Voted and Shared!